This analysis from one of Europe’s most distinguished anti-Semitism researchers. Cover picture, portraying the basic premise of this post, is from June 17, 2002. Scientific measures indicate a massive upsurge of Jew-hatred on the internet, as anti-Semitism reestablishes itself as an increasingly visible element in European mainstream discourse. 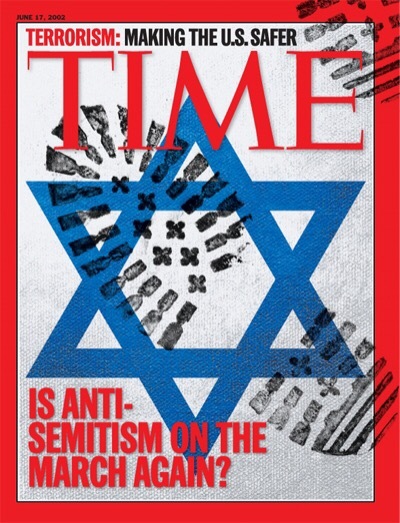 […there is] global Israelization of anti-Semitic discourse. The articulation of traditional anti-Semitic stereotypes by projecting them onto Israel is by now the most dominant manifestation of modern Jew hatred. Scientifically we can draw a very clear distinction between criticism of Israel and anti-Semitism. We give many examples for both types in our book. Those who claim that criticism of Israel and anti-Semitism cannot be distinguished do so in order to excuse or marginalize anti-Semitic views. JERUSALEM — One of Europe’s most distinguished anti-Semitism researchers, Monika Schwarz-Friesel has an alarming message: scientific measures indicate a massive upsurge of Jew-hatred on the internet, as anti-Semitism reestablishes itself as an increasingly visible element in European mainstream discourse. A psychologist, linguist and professor of cognitive science at the Technical University of Berlin, Schwarz-Friesel is one of the most quoted experts on anti-Semitism in both international academic literature and the German media. In her numerous publications she analyzes and exposes new manifestations of old anti-Semitic sentiments — disguised though they might be — employing much of the same Jew-hatred that has been shaping European discourse throughout the years, even when officially outlawed. These analyses are evidence that recent anti-Israeli tropes demonizing the Jewish state are actually work-arounds of old anti-Semitic sentiments that have been with us for two millennia. And now, to further amplify her research outside of Europe, an English translation of her much celebrated study titled “Inside the anti-Semitic Mind” (co-authored with former Brandeis University president, Jehuda Reinharz), will be available this upcoming November. Currently, Schwarz-Friesel, is spending the last part of her sabbatical in Jerusalem, where she met with The Times of Israel on Hebrew University’s Mount Scopus Campus to share some insight into the truly disturbing results of her research. Your book “Inside the anti-Semitic Mind” reviews over 15,000 letters, emails and other correspondence that have been addressed to Israeli embassies and Jewish institutions all over Europe. What do these correspondences reveal? Many of these letters employ classical anti-Semitic stereotypes in order to abuse their addressees, while demonizing the state of Israel and Jews. Jews in general are blamed for alleged crimes by the State of Israel that is slurred as “a hypocritical terror regime, living of the blood of Palestinians,” or a nation of “child-eaters.” Zionism is being equated with racism and Israel is being called an “apartheid regime,” posing the greatest danger to world peace. Such ideas have nothing to do with the reality on the ground. Instead they reflect classic anti-Semitic stereotypes that have been with us for 2,000 years and that brand Jews as murderers and an omnipresent evil force in the world. It is hard to believe that such views are prevalent in contemporary European mainstream discourse. Aren’t they just characteristic of uneducated, radical subgroups? Unfortunately, no. The authors of the anti-Semitic letters that we reviewed included students, lawyers, journalists, doctors, priests, self-employed entrepreneurs, politicians and even university professors. But still, people who address letters to Jewish institutions in order to condemn the State of Israel are not necessarily a representative sample of society. True. However, other inquiries reveal the same anti-Semitic patterns as well in other domains, such as the social media and even in the quality press. In the framework of a new research project on anti-Semitism in the world wide web, supported by the German Research Foundation, I am currently reviewing Facebook posts and reader comments on articles in the quality media. What I am finding so far is a replication of the same anti-Semitic stereotypes. Israel and Jews are being portrayed as overly powerful and vengeful child murderers. Indeed, speaking for Germany, throughout the past 10 years, anti-Semitic content in comments on the internet and in letters to editors has almost tripled. Is this upsurge of anti-Semitism on the internet paralleled by a similar development in the quality media? There are ongoing investigations, the intermediate findings of which raise the suspicion that this could be the case indeed, though it’s too early yet to draw such conclusions with certainty. However, we don’t even have to wait for the definite results of these studies in order to establish that anti-Semitism has resurfaced as an evident element in mainstream European discourse. Just think about the utterances of writer Günter Grass or of the journalist Jakob Augstein that portray Israel in terms of classic anti-Semitic clichés, according to which Jews are a menace to mankind and control world politics. In addition, there is less and less resistance to anti-Semitic utterances. A case in point is the lack of objection upon the conclusion of the speech by Palestinian Authority president Mahmoud Abbas to the European Parliament last June, which raised the false accusation that rabbis asked the Israeli government to poison the water of Palestinians. Abbas even received standing ovations after this speech, which promoted the classic anti-Semitic slur that Jews are well-poisoners. There is a global Israelization of anti-Semitic discourse. The articulation of traditional anti-Semitic stereotypes by projecting them onto Israel is by now the most dominant manifestation of modern Jew hatred. But isn’t it difficult to distinguish such Israel-focused anti-Semitism without being liable to declaring all criticism of Israel per se to be anti-Semitic? Not at all! Scientifically we can draw a very clear distinction between criticism of Israel and anti-Semitism. We give many examples for both types in our book. Those who claim that criticism of Israel and anti-Semitism cannot be distinguished do so in order to excuse or marginalize anti-Semitic views. Yes. And remarkably, in the material that we reviewed, this concern is expressed exclusively by authors of letters that are actually anti-Semitic. None of the authors of the letters that criticized Israel without being anti-Semitic voiced any concerns that they could falsely be accused of Jew-hatred. It is the anti-Semites who actually commit the kind of false accusation which they claim to be a victim of, in order to deny their hatred of Jews. This implies a victim-perpetrator-inversion, which is a historically deep-rooted pattern in the standard repertoire of anti-Semitic constructions. Already in the 19th century anti-Semites accused Jews to use their alleged control over the media to censor and delegitimize anti-Jewish criticism. Slurring Jews collectively as a people of culprits, this statement is clearly anti-Semitic. Equating Jews with Nazis, it also invokes the victim-perpetrator-inversion. A baseless vilification of Israel, which, without giving any evidence, except for the narrative of a random Palestinian on a boat, is slandered as a regime that conducts Nazi-like persecution and killings of national and religious minorities, is taken as a justification to condemn all Jews, be they Israeli or not. In addition to the quotation that you just mentioned, there is another paragraph in the same book, where Ebener questions the legitimacy of Israel’s very existence. This is another typical trope of contemporary anti-Semitism. It would be absurd to suggest that such slander cannot be separated from founded criticism of particular Israeli policies. Many people are concerned that anti-Semitism in Europe could further be aggravated by the massive influx of refugees from the Middle East. Many of the refugees that have been pouring into Europe recently come from societies that are deeply anti-Semitic. It would be foolish to assume that their anti-Semitism can be educated away in a few years and that it won’t leave its mark on European societies. Is a virgin birth possible? The JPS Commentary on Genesis doesn’t deny it! At the beginning of history, humans strove to rise to the level of divine beings, and God intervened. Humankind cannot be immortal. Here divine beings lower themselves to the level of humans, and God intervenes. A severe limitation on human longevity results. The account given in these few verses is surely the strangest of all the Genesis narratives. It is so full of difficulties as to defy certainty of interpretation. The perplexities arise from the theme of the story, from its apparent intrusiveness within the larger narrative, from its extreme terseness, and from some of its vocabulary and syntax. The passage cannot be other than a fragment of what was once a well-known and fuller story, now etched in the barest outline. In light of these and other biblical references, such as Ezekiel 32:27, it is quite likely that the main function of the present highly condensed version of the original story is to combat polytheistic mythology. The picture here presented of celestial beings intermarrying with women on earth may partake of the mythical, but it does not overstep the bounds of monotheism; there is only one God who passes judgment and makes decisions. The offspring of such unnatural union may have possessed heroic stature, but they have no divine qualities; they are flesh and blood like all humans. They are not only mortal, but their life span is severely limited as compared with the personages listed in chapter 5. The one God is recognized as holding sole title to the breath of life, which He controls as He wills. This literary segment has three points of connection with the preceding passage: the opening reference to human fecundity in verse 1 takes up the theme implicit in the genealogy; mention of daughters links up with the oft-repeated formula there regarding the begetting of sons and daughters; and the specific restriction of human longevity presupposes knowledge of the extraordinary ages recorded in chapter 5. At the same time, the story is immediately followed by God’s verdict on human wickedness, and the impression is created, even if not made explicit, that it illustrates the magnitude and the universality of evil in the world. Even the celestial host is corrupted. True, mankind is not condemned here for the acts of angels, but the effect is that the world order has been disturbed. 2. the divine beings The definite article points to a familiar and well-understood term.2 The context in Job 1:6; 2:1; and 38:7 unmistakably proves the reference to be to the angelic host, the celestial entourage of God. This is a poetic image drawn from the analogy of human kings surrounded by their assemblage of courtiers. Occasionally, as in 1 Kings 22:19, “the host of heaven” is used to the same effect. saw how beautiful The implication is that they were driven by lust, so that external beauty, and not character, was their sole criterion in the selection of mates. took wives Hebrew l-k-ḥ ʾishah is the regular term for the marriage relationship. There is no suggestion here of violent possession or any condemnation of the women involved. 3. The Lord said See Comment to 3:22. My breath The life force that issues from God, corresponding to “the breath of life” in 2:7.3 Its presence or withdrawal determines life and death. in man Taken together with the next clause, the reference would be specifically to the offspring of these unnatural unions, but all humankind is included within the scope of the verdict because disorder has been introduced into God’s creation. flesh They are not divine despite their nonhuman paternity.4 “Flesh” connotes human frailty. Psalms 56:5 and Isaiah 31:3 are good examples of this usage. 4. This verse is obscure, probably deliberately so, in order to downgrade the mythic tone. The etymology of Nephilim is uncertain.7 The obvious association with n-f-l yields the rendering “fallen ones,” that is, fallen angels. But it is not clear from the text that the Nephilim are identical with the “divine beings.” Rather, they appear to be the offspring of the misalliances, who continued to generate Nephilim in the course of their married lives. Because Numbers 13:33 implies that these were people of extraordinary physical stature, the term was understood to mean “giants” or “heroes.” While it is not certain from the text whether or not the Nephilim themselves procreated, it is contrary to the understanding of the biblical narrative that they should have survived the Flood. Hence, the reference in Numbers is not to the supposedly continued existence of Nephilim into Israelite times; rather, it is used simply for oratorical effect, much as “Huns” was used to designate Germans during the two world wars. cohabited Significantly, the verb y-d-ʿ is not used, as in 4:1, 17, and 25, but a coarser term, as befits the circumstances. heroes of old, the men of renown Their heroic exploits were the subject of many a popular tale. On the analogy of 11:4, it is possible that they were guilty of some vainglorious outrages. A call for a debate on some key issues! See also: The debate that embarrassed Tovia Singer (05min audio extract). Was Jesus really Jewish? God is one, not three! How can God have a son? How could a literal virgin birth be true?! Well, the (Jewish) JPS Commentary on Genesis doesn’t deny it happened in a different context involving fallen angels & women! And what of this “human sacrifice for sin” … the God of Israel won’t accept that right? 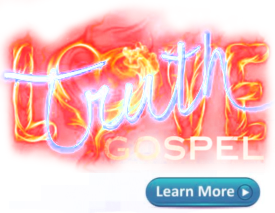 …well, check on the topic of “the death of the righteous atoning for sin” – and of course, check Isaiah 53! It’s all there, all covered plainly & comprehensively below. Let’s face the facts! Call for (another) Debate with Tovia Singer. He has refused to debate for over 20 years! Why another debate? Details here. During the Passover meal, three pieces of unleavened bread is wrapped into one. Later, one of the pieces, is broken in half, wrapped separately, and hid away for the children to find. The child that finds the broken piece gets a reward. 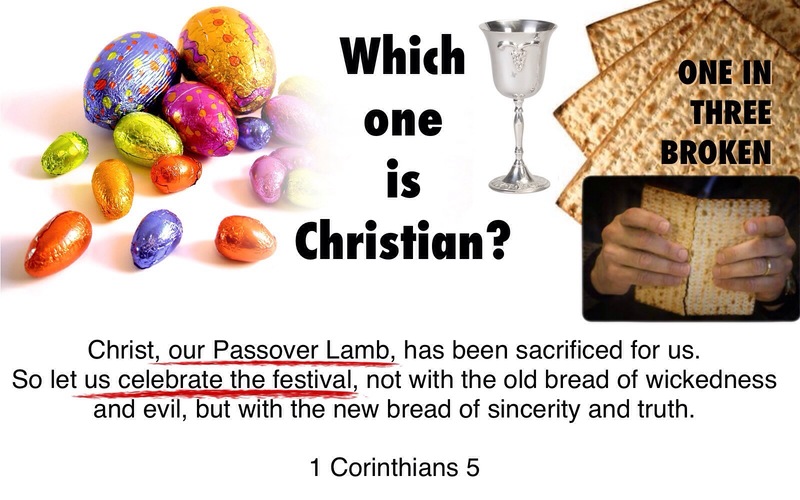 This tradition is so close to the reality followers of Yeshua (Jesus) believe in that many think the tradition was started originally by early believers. More households with a dog than with a child. Nett effect? Think about it, and listen below. Many of these babies were burned to provide heat for hospitals. Yes these were aborted babies. When babies are called ‘fetuses’ it’s ok to murder them & treat them like a removed appendix or nail clippings – just don’t burn them – then the headlines will say ‘babies burnt’! The number above ignores the millions of aborted babies worldwide (incredibly almost 60 000 000 in America) – but these 15 000 souls make a point in a way some of the world may hear. “Come on, lefties. Just think of the carbon emissions from all of those incinerated aborted babies,” said the National Review’s Jim Geraghty. Judgement is coming friends. Know it. The Union of Orthodox Jewish Congregations of America (UOJCA), also known as the Orthodox Union (OU) rebuked Israeli Rabbis for a letter sent to Kerry demanding America to cease & desist “peace efforts” interference in Israel or face the fury & judgement of the God of the universe! This rebuke, challenging Torah / biblical authority enraged Israeli orthodox rabbis – understandably so. Listen to the audio below, or download it here & here.